Credence is The Ultimate Multi-Purpose WordPress Theme. Choose boxed or full screen layouts, unlimited background colors, any accent color, any font color, and take advantage of our amazing advanced shortcodes. Credence is built on bootstrap 3′s excellent responsive framework. Choose from all Google fonts, use all Font Awesome icons, create any number of pages, and design your next amazing website! 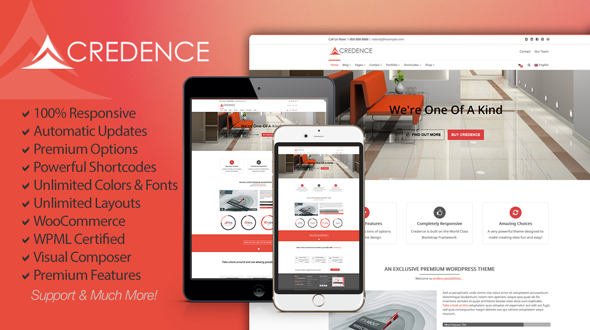 WPML 100% Certified Theme – Credence has been certified by WPML! One click demo import – 100+ example pages and growing! Free Lifetime Updates – get the latest features (and future ones!) with new updates we include for free. Highly Detailed Documentation – We are constantly updating our documentation with useful information to help you with Credence. And much more!, take a look at our demo. 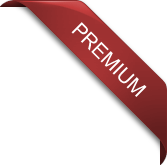 Version 1.1.3 - October, 2014 Initial Release  Version 1.2.1 - December, 2014 -Multisite support & fixes  Version 1.2.2 - December, 2014 -Multiple Theme Options additions -Menu Fonts sizes and custom font can now be set individually -Minified CSS and JS -Less support -TGM Child Theme plugin installation fix -Slider Revolution 4.6.5  Version 1.2.3 - December, 2014 - Visual Composer updated 4.3.5 (WordPress 4.1 compatible)  Version 1.2.4 - January, 2014 - Header Logo sizing control - Blog templates as front page capability added - Translation enhancements  Version 1.2.5 - January, 2014 - LayerSlider updated to v5.3.2 - Visual Composer v4.4.1 - Importer conflict with import plugin fix. - Old php 5.2 fixes (in case you are running end of life code!) - New Demo Import Content (100+ pages of content)! - Now includes 13 example sliders for you to use and customize. - All FA icons can now be used for people custom posts. - Google Webmaster Rich Snippets modifications - New Visual Composer WooCommerce Elements and styling added for products. - New Theme Option – Switch Sides Text and Icons in above navigation. - Input fields and textareas by default now have background color (for pages with color used).